For less than the cost of a doctor's visit you will rediscover simple remedies used by our grandmothers to treat everyday illness and prevent disease. Learn to use common kitchen herbs to combat colds, coughs, fevers, nausea and more! In this class I will teach you simple recipes that can help you care for yourself and your family using teas, syrups and other plant medicines. Take control of your family's health by learning the ancient secrets of herbal medicine. In this workshop you will gain the hands on knowledge of making herbal salves and ointments for health and wellness. You will learn all aspects of making salves, preparing the plants, making infused oils and creating the finished product. Each participant will create their own personalized salve to take home. Do you want to know more about using herbs but find the information overwhelming? In this workshop you will learn how stocking your shelves with only 5 herbs can help you treat most everyday ailments. Discover the simple healing power of plants in this hands-on demonstration! Would you like to know more about the plants of the Sonoran Desert? 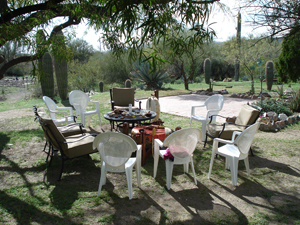 A leisurely walk around the grounds will offer new awareness of the healing properties of our desert plants. 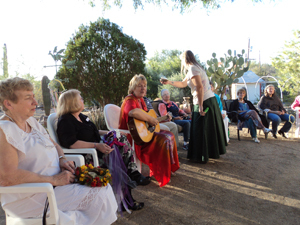 Join Melanie as she shares how native peoples and modern-day herbalists use the bounty of the desert as medicine. Natural body care is about creating and maintaining inner harmony and outer balance. Enjoy the benefits of health and radiance that comes from using products made from healing and aromatic herbs. In this workshop you will learn how to use a few easy-to-find ingredients, a handful of herbs and basic kitchen equipment to make your own herbal spa. All supplies will be provided for you to make your own foot soak, facial mask, bath salts and much more. Learn to make personalized body care products for yourself, your loved ones or to give as gifts. Is this menopause? If you are asking that question then the answer is yes. Join us for an informative discussion of what menopause is and what it isn�t. Learn about herbs and self care that can lessen your symptoms. We�ll take time to explore the spiritual side of this beautiful change. Share your experiences in a supportive environment and learn how other women are celebrating their new Crone wisdom! Learn the basics of this ancient healing modality. Receive your Reiki I attunement and learn hand positions for self-treatment. This class includes giving and receiving a complete Reiki treatment. Book and certification are given for each level. Continue on your journey by learning how to use Reiki to care for others. Learn hand positions to be used on others and how to do distant healing. You will receive your level II attunement along with the ancient symbols. Experience will be gained by giving and receiving a complete Reiki treatment, practice using the symbols and distant healing. Book and certification are given for each level. You will receive your master symbols and attunement. Learn Reiki meditations and how to give attunements. Much of the class will be spent in practicing symbols, treatments will be given and received, and discussion of the values of a Reiki master. Book and certification are given for each level. What is your energy body and why should you take care of it? Just as the physical body needs care and attention, your energy body also needs regular maintenance. This workshop examines some of the causes of low energy and offers tips and techniques to help you restore energy into your life. Learning to balance your energy can help you rediscover the lightness of life and the joy of being alive! The Chakra System is a map for the journey through life. Its seven rainbow colors represent the full spectrum of human possibility. Working with your Chakras is an exciting journey of awakening! In this 7 week course you will learn to recognize imbalances in the Chakra system and learn techniques to awaken and connect with your Chakras. Experience meditations and breath awareness that are designed to promote a deeper understanding. There are many challenges on the journey of life. This course gives you knowledge to help make that journey uniquely your own. It is good to give and receive! This monthly gathering is an opportunity to give a healing session and receive one. No experience necessary! Whatever your healing talent is....Reiki, Body Talk, Tuning Forks, Intuitive Response or something new, come share an evening with like hearted people. 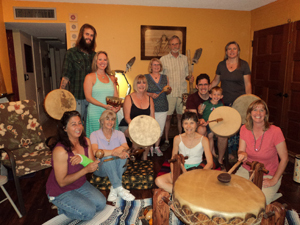 Our drumming circle uses the beat of the drum to assist in gaining access to your Inner Wisdom. Rhythmic drumming can produce deep relaxation, a sense of well-being or feelings of being light and energized. No experience necessary. If you have an instrument please bring it...if not we have a few extras. Held the first Saturday of each even numbered month beginning at 3:00pm. Feb, April, June, Aug, Oct, Dec.
An evening of discovery, friendship and sharing for women seeking to find a path to their own inner wisdom. 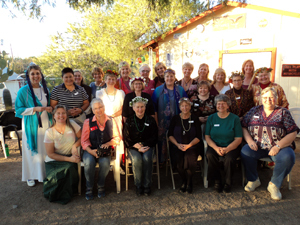 Each month women of all ages come together to have fun, support each other and strive for true inner peace. Sisters supporting sisters. A quest is the search for something important. At this overnight event we reconnect with our spirit guides, finding and embracing our own inner wisdom. Sharing, journaling, walking the labyrinth and making new friends are all a part of each quest. After our overnight dreamtime we gather together, as our mothers and grandmothers before us, to prepare and share a bountiful breakfast. World Labyrinth Day is a day that brings people from all over the planet together in celebration of the Labyrinth as a symbol, a tool, a passion or a practice. World Labyrinth Day, a project of The Labyrinth Society, is celebrated around the world on the first Saturday in May. As part of this celebration you are invited to "Walk as One at 1" to effect a rolling wave of peaceful energy as the world turns. All around the globe people just like you will be walking Labyrinths at 1:00pm in their local time zone. 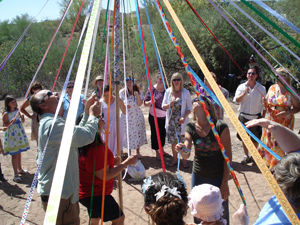 Here at the Peaceful Spirit Labyrinth we will be celebrating together, helping spread peace one step at a time. 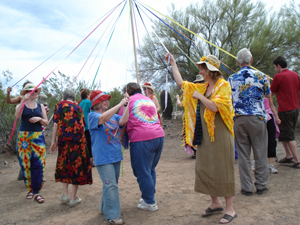 Celebrate the return of spring with a traditional Maypole dance. Reconnect with the beat of Mother Earth. Starting with a kit we will assemble and create our own unique flutes. Blowing energy into them with our own breath. Learn to make your own drum. Perfect for those regular drumming circles. �I�m still on a high and noticing all kinds of �signs� that my Quest work is in progress! Yes, it was indeed Magical! Thank You so much for holding sacred place for all of us to connect on such a deep level with each other.� —Jeannie C.